SUNRISE, Fla. – The Florida Panthers announced today a partnership with HappyOrNot®, integrating 10 Smiley Touch Kiosks at BB&T Center to receive real-time fan feedback during hockey and events. With offices in Tampere, Finland and West Palm Beach, Florida, HappyOrNot ® kiosks are aimed at improving the overall guest experience at BB&T Center. The kiosks located around the arena allow fans to rate their experiences at concessions and other parts of the event-day experience. Real-time feedback is then collected giving the arena and the Florida Panthers the opportunity to best serve their fans. 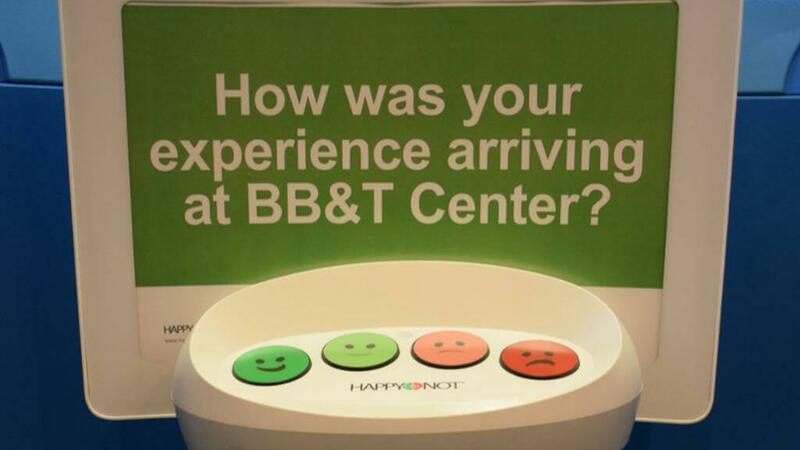 Guests of BB&T Center can spot these terminals around the arena and give feedback on their experiences. As always, feedback is also accepted at the Client Experience Desk at the North VIP entrance and through FloridaPanthers.com and social media. Celebrate 25 Years of Florida Panthers Hockey all season long as we recognize a milestone season and honor, celebrate and welcome home some of the most integral players and figures who have shaped the first 25 years of Panthers history. Visit FloridaPanthers.com/legacy for full details. Join our territory and become a Season Ticket Holder to enjoy exclusive savings on select BB&T Center concessions, 25th Anniversary Discount at Pantherland store and priority access to BB&T Center concerts and events. Visit FloridaPanthers.com/TicketCentral orcall 954-835-PUCK (7825) for more information. HappyOrNot ® is the global leader in instant customer and employee satisfaction reporting. Our innovative feedback collecting smileys and intelligent data analytics reporting service help our clients to improve their customer experience, relationships, and employee engagement. We serve nearly 4,000 companies across 117 countries and have collected and reported over a half billion feedbacks. For more information, visit: www.happy-or-not.com.